An investigation is under way in China after a two-month-old baby boy in Zhejiang died soon after being fed baby milk powder for the first time. The milk powder was produced after strict controls were introduced following last year's melamine scandal. Six babies died last year after the toxic chemical was added to milk powder to boost its protein content. Officials say while it is possible there was a problem with the milk in this case, the possibility is low. The investigation is being carried out by medical staff, commerce officials and the police in Zhejiang province. The milk powder the boy was fed has been sent to a laboratory for analysis. His family have told the newspapers that once they have the results of those tests, they will ask for an autopsy on his body. Li Junjie, who was just two months old, was admitted to hospital on Sunday after he started to vomit. His grandparents had given him the milk powder for the first time the day before. They say he had not been unwell previously. Local officials have confirmed they are trying to establish whether the milk powder was contaminated, and whether it was to blame for the child's death. But they point out that it is possible that there could have been other causes. The revelation last year that the toxic chemical melamine was added to milk to boost its protein content destroyed confidence in China's dairy industry. 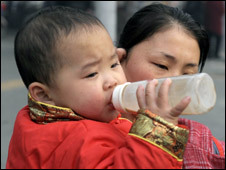 At least six children died after drinking contaminated milk products, and hundreds of thousands were taken ill. The batch of milk powder the family bought was produced after strict controls were imposed on producers to try to prevent a recurrence of the problem. The investigation into this case is expected to last a week.